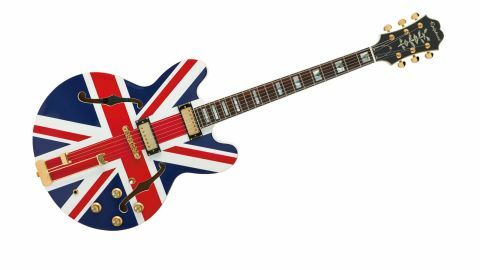 Those who are passionate about vintage tone are sure to find the Union Jack Sheraton Outfit the brazen archtop to fly the flag for the sounds of the British Invasion and its Britpop retooling. Solid bridge. Nicely playable mahogany neck. Brit-pop/mod fans will love the finish (obviously). There is no question that the Epiphone Union Jack Sheraton Outfit is one of the more eye-catching archtops on the market. First impressions that any serious player might take away could include: "Nice! Those gold-plated Grover machineheads and elegant Epiphone Frequensator tailpiece offer a touch of refinement - good to see in a mid-priced instrument"; "That 1960s SlimTaper neck profile is a real joy to play"; "Gibson mini-humbuckers? Well, there's a bona-fide tone guarantor of vintage snap, spank and attitude"; and "Oh, yes, you can see there are decades of breeding, with pedigree Epiphone appointments such as the sloped dovewing headstock with leaf inlay." "The Alpine White finish has evidently been punked to outrageous effect by Geri Halliwell's 1997 stylist"
But what we're all really thinking is that the Alpine White finish has evidently been punked to outrageous effect by Geri Halliwell's 1997 stylist. Originally limited to 1,000 pieces, the Union Jack Sheraton Outfit is a guitar made famous by Noel Gallagher, and is definitely maybe not for shrinking violets. Oasis superfans, Britpoppers, Brit-rockers with Live At Leeds on repeat, and die-hard mods with RAF roundels for eyes will love everything about it. But this is a bright and refined classic with a lot more to it than its finish. Firstly, it has a great spine, with a mahogany neck glued to a laminated maple body, and a rock-solid LockTone Tune-o-matic bridge holding everything in place. Secondly, it has a great playable feel, with its classically Gibson/Epiphone 629mm (24.75-inch) scale length and lithe neck accommodating to a fault. The Sheraton is instantly associated with the toothy, gnarly spangle of nouveau Brit-rock epitomised by the Gallaghers, but it handles busy jazz playing and strong-armed blues without breaking a sweat. Thirdly, the guitar was built in China, and that's reflected in its modest price tag and slightly untidy finish. Its voice is naturally bright, if a little shrill, yet rolling back the tone on the neck position's mini-humbucker will give jazz cats plenty of woody definition. The bridge 'bucker is treble incarnate, with bite and venom when played through a hot overdriven valve amp and a US of A country twang. The finish will divide opinion. Those turned off by it can always seek out Epiphone's 50th Anniversary 1962 Sheraton Outfit, available in more demure Vintage Sunburst, Natural and Cherry Red. But many players will buy the Sheraton because of the finish.